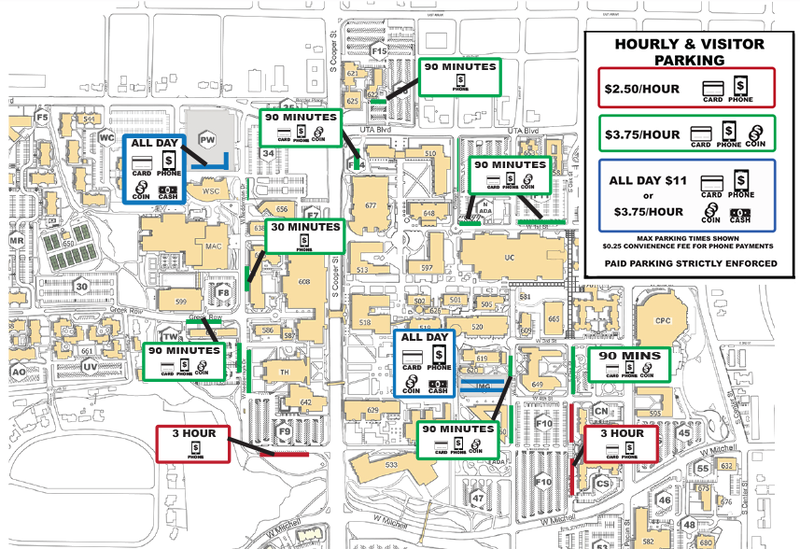 Metered parking is changing around campus as part of the new meter master plan that gives customers more options. In some areas, meter heads were removed and a pay station installed. The meters are designed for short-term parking, allowing customers a place to quickly park and run into a facility to handle brief business. The meters are $3.75 for 30 minutes and 90 minutes and $2.50 for three hours. See the map. For customers wanting long-term metered parking, the Maverick Garage and West Parking Garage offer an all-day rate of $11. The old coin-only meters will be replaced with a combination of pay-by-app-only meters or pay stations. The MobileNOW app is free. There are existing credit card meters that will remain and still accept coins and credit cards. Bills eventually will only be accepted in garages. The new signage is planned to better communicate with customers about the meter rates, maximum times, and payment methods so they can make the best decisions for their parking sessions. Parking permit holders—faculty, staff, and students—must pay at metered parking spaces. For more parking information, go to the Parking and Transportation Services website at uta.edu/pats.